Give your groom a little razzle-dazzle to look forward to on your wedding day. Our 8mm men’s titanium wedding band with nine channel-set cubic zirconia stones provides the perfect amount of sparkle to give his accessory selection the update it deserves. Diamonds might have been a girl’s best friend, but men are warming up to these swanky stones without showing any signs of slowing down. 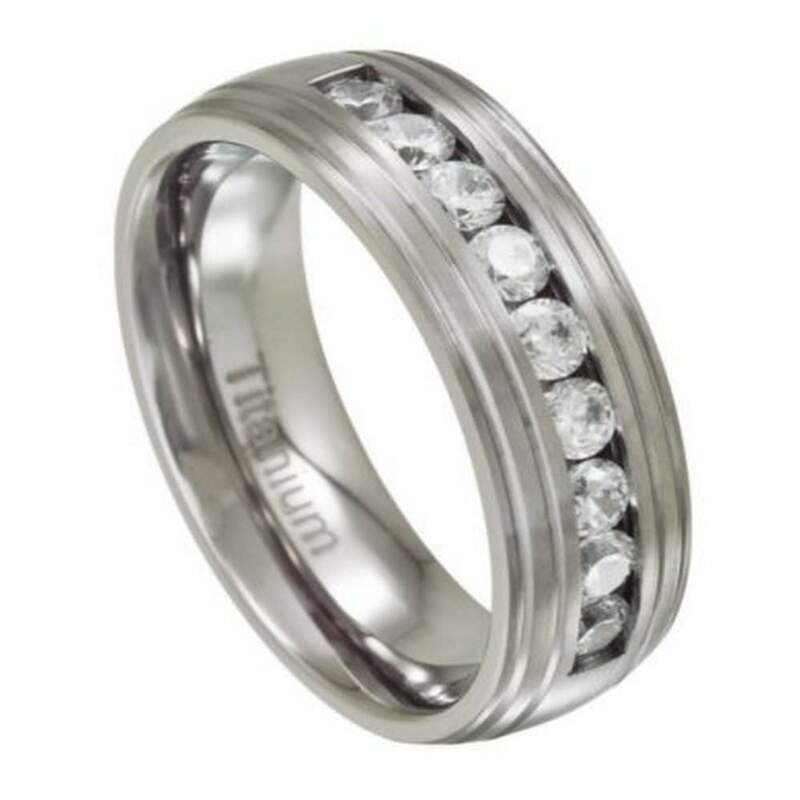 Our men’s titanium wedding band with nine channel-set cubic zirconia features a double-grooved channel accentuated by neatly nestled cubic zirconia stones that gleam brilliantly in any kind of lighting. The 8mm band is also the perfect width for men who might not be used to wearing jewelry. Titanium is also growing in popularity, because it is resistant to corrosion, denting, discoloration, and tarnishing. The 8mm men’s titanium wedding band with nine channel-set cubic zirconia strikes the perfect balance between tradition and modern style. We designed this wedding ring in the comfort-fit style to accommodate large knuckles. Comfort-fit wedding rings tend to measure a half size smaller than traditional wedding bands. We recommend that your groom have his ring finger measured for the comfort-fit style, so he can be sure that it’s right for him and his lifestyle. We offer a wide variety of sizes, so you are guaranteed to find the perfect fit. Let your love shine brightly on the big day and every day thereafter with a sparkling ring on your groom’s finger. If you have any questions about the men’s titanium wedding band with nine channel-set cubic zirconia, please contact JustMensRings.com today. The sparkle and fit of this ring are magnificent!! I am a little disappointed that the metal is so dark. I was hoping for a high polished shine. But, rating it on the cost you just can't beat it. If you want something more you need to spend the extra cash. These are the perfect wedding bands! We are so happy with our purchase and highly recommend this band. Customer service was expedient and awesome! The ring is beautiful! Definitely a great buy for someone that works outside a lot. Very durable and beautiful! Very pleased! Bought this ring to replace my lost gold wedding band. I was quite impressed with the quality and appearance. It also has a nice feel on the finger and can be worn CZs inward for a casual look or CZs upward for a dressy look.